“Of all the men that have ever walked the planet, it is probably true to say that Richard Burton between the years of 1948 and 1962, was the most attractive.” Author Tom Rubython’s monster of a biography has a flavour of hyperbole that is all its own. In these critical days a book's physical appearance is likely to be weighed up against the sameness of the e-book. “And God Created Burton” is a heavyweight. Seven centimetres thick it comes in at eight hundred pages. The publisher has not stinted on illustrations; one hundred and ninety-eight pictures follow the life from birth certificate to coffin. Attitudes of biographers to their subjects vary. That curious writer Roger Lewis took on Anthony Burgess in 2002, despite having neither admiration nor affection for his subject. Tom Rubython adores Richard Burton. Or at least he adores one aspect. His book gives small hint of the Burton that Gwynne Edwards staged in 2010, the man whose most exalted moments were spent quietly at home in Celigny with his extensive library. Burton, along with Stanley Baker in early days, was no doubt a hell-raiser. In Rubython’s view “He could…use the ruthlessness of any a red-blooded male with absolutely no discrimination and zero emotion.” But this is speculation. No evidence is given as to whether he did or did not possess zero emotion. Rubython came to Burton via his 2010 biography of James Hunt with whom Burton shared third wife Suzy. The racing world is the author’s thing. 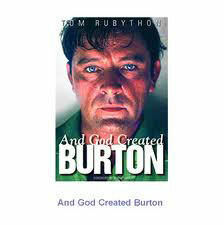 “And God Created Burton” does not read as if he is much at home with theatre. “Look Back in Anger” is set in the Midlands but Jimmy Porter here is “heavily cockney-accented.” Theatre, a prelude to the film life, is for “culture-imbibers”. Christopher Fry gets a half-sentence. A young Joan Collins seeing “the Lady’s Not for Burning” gets paragraphs on end. The research is prodigious and the details of childhood are treated at a length that no previous biographer has attempted. But there is small evidence that Rubython has seen a play or film. The judgements on the acting are cut-and-paste jobs from critics and former biographers. Just where the reader expects the authorial presence, there is a void.